A kid finds a board game that, once it is being played, brings the fictitious and dangerous jungle world of Jumanji to life. Board games are fun group activities, but what if playing one meant you'd be accosted by animatronic animals and poorly CGIed monkeys? Oh wait, those were supposed to be real animals! This is the concept for the 1995 family adventure film "Jumanji." It is directed by Joe Johnston, who is known for directing films like "Honey, I Shrunk the Kids," "The Rocketeer," and "Captain America: The First Avenger." It is based on the 1981 children's picture book of the same name by Chris Van Allsburg. The story begins in the late 60's where a bullied kid named Alan Parrish, played by Adam Hann-Byrd, finds a unique board game called "Jumanji" at a construction site. After an argument with his father about being sent to boarding school, he is fixing to run away until his crush stops by his house to see him. The two sit down to play the game not knowing it is actually magic. On Alan's turn, he is sucked into the game. 26 years later, a sister and brother named Judy and Peter Shepherd, played by Kirsten Dunst and Bradley Pierce, find the game, and when they begin to play it, Alan, now played by Robin Williams, is released from the game along with a bunch of other wild animals and dangerous jungle vegetation. In order to make the madness go away, they must finish the game that was started 26 years ago. For some people, "Jumanji" may be a classic film held in high regard because they remember it fondly from their childhood. For us, it is one we sort of enjoyed in our youth but never really connected with or understood the fuss about even back then. We thought we would give it another watch prior to the release of its sequel, "Jumanji: Welcome to the Jungle." It turns out, "Jumanji" is just how we remembered it: a middle of the road family adventure film. The premise is interesting and the execution is decent, but the special effects are extremely dated, especially the aforementioned CGI monkeys. We have a hunch they didn't even look that great back in 1995 when the movie was released. Robin Williams does an okay job as the older Alan Parrish, but he doesn't get a lot of room to let his comedic repertoire shine apart from his initial appearance as a crazy jungle man. Dunst and Pierce spend the entire movie shrieking about the various creatures hunting them down during each turn, so is it a compliment if we say they do it well? The movie does get a little repetitive as it consists of characters rolling the dice, then having to run, rolling the dice, then having to run, rolling the dice, then having to run, rinse, lather, repeat until the credits roll. It's a simple story with a very flimsy narrative, though it does wind up creating some interesting existential question about existence and the overall power of the Jumanji game. 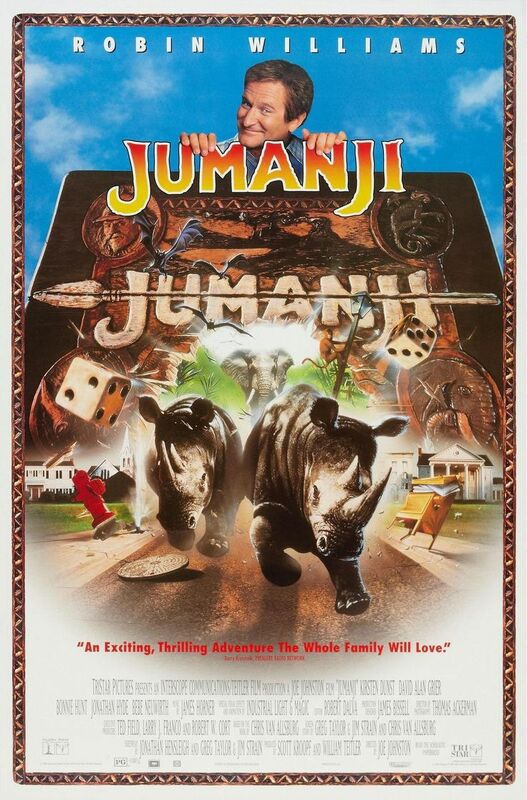 In the end, "Jumanji" remains somewhat enjoyable, but is mostly just another mid-90's mediocre family adventure film. We can name a dozen movies we loved as kids that are much better than this one.